"The Evidence caused by the Bink's Spoon"
In most of the clearwater lakes, impoundments and other bodies of water around the world including oceans and seas, the easiest way to find fish is to find the schools of baitfish. In the freshwater areas of North America, often these schools of baitfish are shad. When you find the "balls" of shad on your depth finder, you will almost always find fish holding under these shad. Sometimes these massive schools of shad will be in deep water, meaning 50 feet or more and the only effective way to catch the fish without the use of downriggers is to position your boat over the school and fish vertical with a jig or spoon. 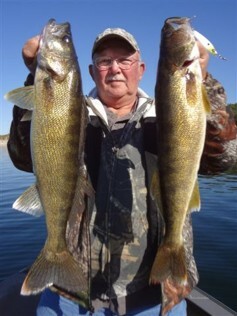 Well known guide, Darrell Binkley of Bink's Guide Service, in Norfork, Arkansas used his many years of experience when developing one of the most effective spoons for vertical fishing that is available to the fisherman today. The Bink's Pro Series Spoon is unique in that it is perfectly balanced so it falls with an action that fish can't resist and doesn't hang the line on the hook. Bink's spoons are very attractive and realistic in appearance. The cast spoon is either painted white or metalized and overlaid with graphics which closely resemble baitfish. Then oversize eyes are added to give the spoon an even more real look. It has been documented that a predator fish will zero in on the eyes of its prey so it is reasonable to assume that the more visible the eyes are, the easier it is for a fish to target the bait. The spoon closely resembles a young of the year shad and when dropped into the water, it flutters from side to side while sinking, much the same as an injured shad. Any predator fish will hit the Bink's Spoon without hesitation because of its striking likeness in its look and action to a real shad. of his special honey holes. "Bink" fishes exclusively with artificial bait!